Olga, Tatiana, Maria, and Anastasia. Like the fingers on a hand--first headstrong Olga; then Tatiana, the tallest; Maria the most hopeful for a ring; and Anastasia, the smallest. These are the daughters of Tsar Nicholas II, grand dutchesses living a life steeped in tradition and privilege. They are each on the brink of starting their own lives, at the mercy of royal matchmakers. The summer of 1914 is that precious last wink of time when they can still be sisters together--sisters that link arms and laugh, sisters that share their dreams and worries, and flirt with the officers of their imperial yacht. 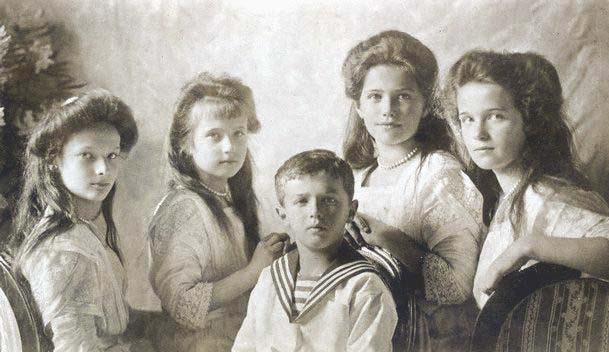 I have been fascinated by the doomed Romanov children for years. I think it's because they took so many photos of themselves. The photos make the imperial family in their pretty dresses and sailor suit with the occasional smile (unusual in pictures of that era) make them look approachable and real. It makes their ending seem even more horrible. The Lost Crown covers the last four years of the imperial family's life. It starts out at the beginning of World War I, when things are basically fine, with just an undercurrent of problems to come. The imperial children have a charmed, happy life, marred only by Aleksei's hemophilia. The book is told from the alternating perspectives of the four girls: Olga, Tatiana, Maria, and Anastasia. The author does a good job to give each character unique personalities, but having four voices going through basically the same things does make the book a bit confusing. It is easy to forget that the girls were in their late teens and early twenties during this time period. Throughout the book, they seem much younger than their actual ages. They've been so sheltered throughout their lives, that they are more children than young women. They keep this naivete even as things go increasingly sour. While it seems odd that people of their age would be so immature, I am guessing this may be fairly realistic. They really weren't exposed to the real world. I was surprised the book was as long as it was. The author did a good job of switching things up, showing things from different points of view, having events move steadily forward, but I still think you easily could have docked 50-100 pages. That being said, I was impressed with how she managed to add plot and drama to the girls' lives in captivity when every day was really more of the same. The main problem with this book can't be helped. It is Depressing, with a capital "D." Not because the author makes it that way, but because it's reality. I became attached to these characters throughout the book. They were sweet, innocent, and loved Russia. But I knew there would be no happy ending. No last minute hero coming to rescue them. And I desperately wanted that. They lived every day completely ignorant that it was one day closer to their last - and I knew going in when that last day would be. I was very impressed with the book's ending. She wrote the Romanov's deaths in a way that was simple and poignant. It brought some closure to an otherwise horrible tragedy. 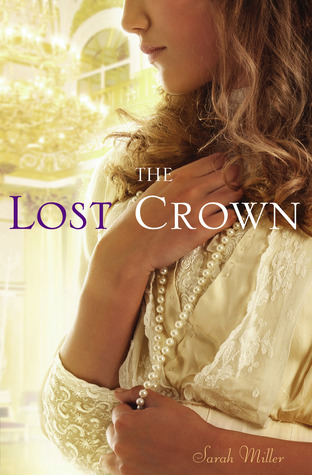 The Lost Crown is a great book for anyone interested in the Romanov family. It's not a super-speedy read and it is very depressing, but it is consistently interesting and sweet. I've been looking into reading this, so thank you for posting your review! I've been interested in the Romanovs for years now, and I've read a few books on their story in the past. But you're right, it's such heavy material that it can be difficult to go through. I have always been interested in their story and history eventhough it is sad. I will have to check this out. Great review. This sounds like a good book (even if it is a bit depressing). I really am very interested in the Romanov family so I'm definitely looking forward to reading this one! I just finished studying Russia in History and we learnt about the Romanovs! This definitely sounds intriguing, I'm glad you enjoyed it. Sounds good - perhaps better than The Tsarina's Daughter by C. Ericksson I have read recently. Great review! I've always been fascinated by the Romanov family too! I've never heard of this book before but it's definitely going on my list now despite being ridiculously depressing:) Fabulous review Alison! I don't know much about the other Romanovs besides Anastia, who seems to be the most popular of the kids. I'm glad that the author included the other children too. Though it might be depressing, I'm interested to pick it up to learn more of their lives. Great review! I felt the same way. Lots of great stuff about the war and many different pov's. Great objective review! I was very curious about this one. Like you, I have always found the Romanov children interesting and I can definitely see how this book could come off being very depressing. I think it's hard to have that uplifting hope and do commend Miller for writing the characters death in a way that was realistic. Excellent review. It's interesting that this book is told from alternating points of view, because all the books about the Romanovs I read have all been from Anastasia's point of view. Excellent review! I loved that you added pictures of the girls too. It really is such a sad story. I saw this book on galleygrab, but decided against it. As much as I love history, I find historic books boring. Maybe one day I will give this story a try. I am glad that you enjoyed it. Excellent review of a fascinating family saga. Wonderful review. I've heard the same things from pretty much every review: Depressing, confusing character POV, and you really get attached to the characters. Whenever I read books like this, I always want some white knight to come out and save them. In book 9 of the Sookie Stackhouse series, Aleksei appeared as a vampire and it honestly outraged me. I guess for me, because of how tragic the family's history is, especially with Aleksei being a sickly kid, I just didn't appreciate his fictional portrayal as a vampire, even though I really love vampires. Why I'm sharing this bit of useless info, I have no clue, but I do have to agree that I'm fascinated by the Romanov children, too. Maybe just not so much in fiction. At least this story seems to be respectful of their lives, even if it was depressing. I love learning about the history of the Romanov children too! Although, yeah, I can see your point where any ending to their story is going to be an unfortunate one and thus make for a bit of a depressing read. I've had a fascination with the Romanovs too, ever since seeing the animated movie. While I do feel like a know a good amount about them, I don't believe I've ever actually read a book on that. Obviously that needs to change ASAP and this looks like a great way to start! Excellent post, I will be checking back regularly to look for updates.. Thanks..